Portable for Traveling — This resistance cords kit comes with a cloth pouch. The portability and versatility of the bands make them ideal for workout while traveling.Every WOLFWILL product includes 90 day money back ,24 months warranty and 24 hours good customer service. 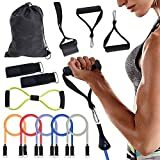 It is suitable for you to keep fitness at home or on traveling. A full body workout online generally uses nothing but resistance bands like WOLFWILLbands set that allows you to freely combine with these 5 different loading bands to customize for your fitness plan! It allows you to easily exercise at home or outdoor, no need to spend expensive money on gym clubs and fitness courses. The resistance tubes are made of premium rubber latex, it can withstand strong extension. Durable for long time use.